Many Web sites and early e-mails and listserv postings referred to the recording as a “promo tape” called “Louisiana Blues,” inferring that the tape might be a demo EP or maxi-single. Very few of these cassettes were made, and they were never commercially available. Howlin’ Wolf’s “Commit a Crime” is often wrongly called “Louisiana Blues” on Devils bootlegs. No official Red Devils or Def American discography makes mention of this song. Through persistent Google searching, tinkering with search terms for best results, nofightin.com finally got a lead on discogs.com in late April. The tape’s owner, kiedisman, had uploaded the cassette’s info to the site about five months earlier, noting “This Was Only Available To Wholesalers To Listen To Before Purchasing Product From The USA.” There was no catalog number, no cover, and no copyright year (though it’s safe to assume the cassette came out in late 1991 or early 1992). After several weeks of bartering, a trade was arranged, and nofightin.com took possession of the 17-year-old cassette in late May. With no other information but artist names and song titles, it is nearly impossible to determine when “Louisiana Blues” was recorded, and who performed on the track (and without clear verification of the recording dates for “King King,” there are still some unanswered questions about this song). Former Georgia Satellite Dan Baird’s album was released in October 1991; hard rockers The Four Horsemen’s disc in August of ’91. Other albums represented on the tape came out in 1992 (though European release dates may have been later than in the U.S.). “King King” — which “Louisiana Blues” was ostensibly included to promote — wouldn’t come out until the second half of ’92. 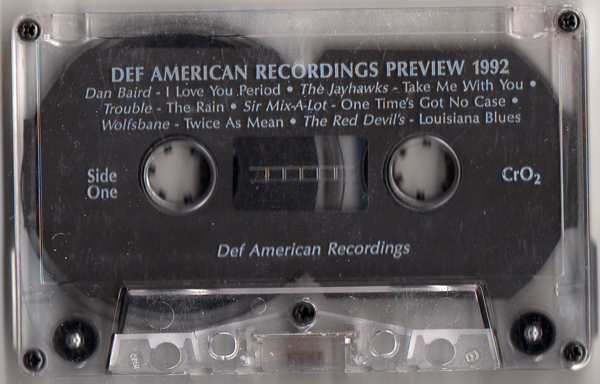 In fact, most of Def American’s high-profile 1992 releases are promoted by music on the tape (notable omissions include The Black Crowes, Danzig and The Jesus and Mary Chain). Why this band — and this particular song — were chosen to represent the Def American label in 1992 remains a question mark, an out-of-context surprise to close out Side One. It’s among tracks by Slayer and Sir Mix-a-Lot that The Red Devils sound thoroughly anachronistic. While there was speculation that “Louisiana Blues” might have been an unreleased “King King” live track, a tasty preview of the proto-punk style the Devils would become famous for, the studio song instead hints back to the more traditional sounds of the Devils’ precursor, The Blue Shadows. Make no mistake: This is real, traditional Chicago blues. Where “King King” sonically puts the listener right on stage among the buzzing amps, here it’s easy to visualize the full band sitting semi-circle, with vintage guitars, upright bass and a wooden chair for percussion, banging out one of the earliest of Muddy Waters’ classic Chess recordings. It’s a seismic shift in dynamics, tone and volume from preceding track “Twice As Mean” by Wolfsbane, hinting that the Devils cut may in fact be an unproduced demo. The band is instantly relaxed, playing a perfect midtempo shuffle, showing a control that only the most disciplined blues bands can muster. Lester Butler’s harp is unamplified, resurrecting one of Little Walter’s earliest recordings with Muddy. Butler’s singing voice is clear, with a self-aware, emotive quality not heard on “King King.” It is a vocal revelation. But he’s got a great track to work with. The clippity-clop rhythm is almost rockabilly in its simplicity and sound, with Paul Size and Dave Lee Bartel (one assumes those are the guitarists on the session) tangling with a telekinetic kinship. They are the Muddy and Jimmy Rogers here on a song so perfect it could easily be taken by time machine back to Maxwell Street 1954, and played on the radio to appreciative audiences. Ironically, it’s on this song that Muddy offers that he’s “going down in Louisiana, little girl behind the sun,” a lyric Butler would crib repeatedly in many different contexts over the next seven years. Strangely, the song has no kinship to anything else in the Devils’ catalog — save for great blues musicianship and style. With only 15 official songs to their name, the Red Devils mystique has been bolstered by the myths of its unreleased recordings. An album with Mick Jagger. Sessions with Johnny Cash. An unreleased sophomore band album. “Louisiana Blues” — as a song and a mystery — fits into the mythology perfectly. However, in a bittersweet way, it’s almost disappointing to have this cassette in hand; there is something almost sacrilegious about being able to call the song up anytime on iTunes. Sort of like finding Bigfoot, and just keeping him on a leash out back, and checking in on him every so often. POSTSCRIPT: Obviously, details about this song are few. If anyone has any more information — recording dates, band lineup, release information, cover art or album credits, etc. — please let us know. This entry was posted on July 13, 2009 at 10:15 am and is filed under red devils with tags andrew dice clay, blues, cassette, def american, four horsemen, jayhawks, louisiana blues, mp3, muddy waters, promo, rare, red devils, sir mix-a-lot, slayer, wolfsbane. You can follow any responses to this entry through the RSS 2.0 feed. You can leave a response, or trackback from your own site. Great post – I remember Wolfsbane, man going from that band to Lester is quite a leap! Whats up folk? By any chance do you think you could send me and MP3 version of Pretty Tone Capone Cant Talk To Long on the Telephone. Ive been looking for it for years and cant find it anywhere. For those over the years who have asked about getting a copy of “Louisiana Blues,” please contact me by email.